What's two generations better than folding pedals? 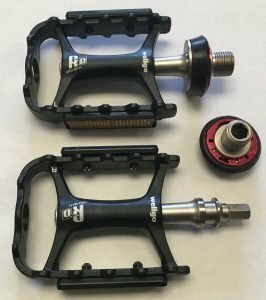 New pop-off pedals! Serious road bike riders are a rather demanding sort–expecting low weight and high quality for all components–so at Flatbike, we listen very closely to their feedback. And one topic of frequent discussion has been pop-off pedals. There’s no question that pop-off pedals beat folding pedals hands down in any performance criteria. And the consensus was that the first generation Wellgo pop-off pedals were an improvement over the MKZ pop-off pedals that we had already put on clearance. But some of the most focused pedal aficionados wanted us to up our game even more. After all, they had experienced the next-generation pop-off pedals in SPD and wanted the flat pedals to use the same advanced latch. This short video explains the differences between the two latch types. We now have a flat pedal in stock with the advanced latch. Here’s what it looks like. The locking latch is backwards-compatible with prior Wellgo pop-off pedals. Some folks are completely happy with the first-generation latch, which come from the manufacturer with all CHANGE bikes. So we are leaving them on sales of the CHANGE bike 611, 612, and 702 unless you specifically request an upgrade. We also will continue to sell them on Amazon at a discount until we’re out of stock. But let’s be clear. The second-generation pop-off latches are the future at Flatbike. 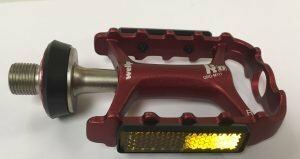 If you want second-generation flat pedals for road bikes, here they are, in red or black. Some astute Flatbike browsers will note that our MTB pedals are still first-generation. We’re also nearly out of stock. What will replace them in a month? Second-generation MTB pedals, all part of the same compatible family. For all upcoming CHANGE bike models from the manufacturer–more on that later–we are specifically ordering them shipped to us without pedals so we can provide the new latch standard on all of the latest bikes by default. Now THAT’S Flatbike service! Happy riding…on some really nice pedals.